1	Preheat the oven to 200˚C, gas mark 6. Cut the aubergines in half lengthways, then into thick semi-circles. Toss in a roasting tin with 4 tbsp oil, the baharat and season. 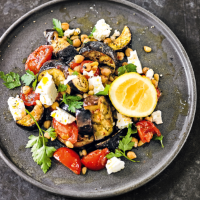 Roast for 25 minutes until softened, then mix in the pine nuts, chickpeas and tomatoes and roast for a further 8–10 minutes, until the nuts are golden. 2	Remove from the oven and mix in the remaining oil, garlic and the pomegranate molasses. Pile onto a platter and scatter over the whole parsley leaves and feta. Delicious with lemon wedges to squeeze over and warm crusty bread. This recipe was first published in Thu Mar 29 10:13:01 BST 2018.